Albion players celebrate promotion on Monday. Brighton & Hove Albion will take part in an open-top bus ride around the city to celebrate their promotion next month. 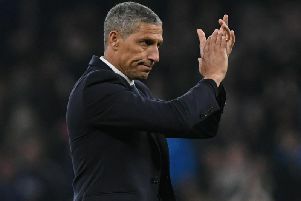 The Seagulls sealed promotion to the Premier League on Monday and Brighton & Hove City Council leader Warren Morgan has invited Albion's players, chairman, directors, management and staff for an open-top bus tour and civic reception on Sunday, May 14. The council have confirmed they will honour Albion's promotion heroes, with the bus tour of the city and reception, after they clinched a place in the Premier League with Monday's 2-1 win over Wigan Athletic. The parade will be along the seafront and is expected to start at around late afternoon/early evening. Brighton & Hove City Council are working with the club to finalise exact plans further details will be released in due course.